When we compare luxury and technology, we may never get a fair comparison. But when you put these two aspects into one single bowl, we’ll find Tag Heuer Connected Modular 45. With classy design and high class material it has, this smartwatch will never be comparable to other average products in the market in term of premiumity and price. Looking up to the solid and luxury Tag Heuer Connected Modular 45, we can naturally sense that this product is a fashion forward and irreplaceable smartwatch with better connectivity than any other Tag’s analogue watches. Even when compared to other high end smartwatch products, the Modular 45 is really in the different level. Yes it’s may be much pricier and not as sophisticated as others like Apple Watch 3 or Samsung Gear S3. But it’s a branding game. We may see people prefer to buy Audi over Toyota, or wearing Armani suits over Forever 21. It’s because brand values more in some ways that vast majority of people do not understand. Tag has strong statement in its Modular 45 design. The design is truly a definition of luxury, and style. Every material chosen is premium, and obviously superior to other cheaper options. And as stated before, even if Modular 45 doesn’t bring all tech sophistication brought by other competes, but its premium design and material win in so much level. It looks good, it feels good, and it does lift your classiness up. On glance sight, you may relate Tag Heuer Connected Modular 45 design to the Huawei Watch 2’s. It has numbers of bezel, and plain face. But, a closer look to the Modular 45 will blow this comparison away since the watch is really a piece of designer art covered in premium materials. The design is masculine with bulky look, at least compared to other Tag’s analogue watches. On the screen side, it uses 1.39 inches diameter AMOLED display with 400 x 400 pixels resolution. This screen gives amazing 287 ppi of depth with bright, vibrant, saturated, and punchy colors. It may not as bright as other competes from Apple or Samsung, but the screen is quite respectable. With less unnecessary effects and shading, the real-watch interface looks so real even on the digital screen. As its name, this watch is modular. Meaning that we can customize our Tag Heuer Connected Modular 45 as we want, but surely, more customization means more money needed as the cost of each part must be sky high. First, we can choose the strap. Second, choosing the lugs is also possible. And the last, body and bezel are also customizable. Being able to customize the straps is something common for smartwatch game. Either smartwatches or fitness tracker is also allowing this feature. But, being able to customize the lugs and body is really something else. Yes, Tag allows you to choose your Modular 45 body color and materials. For the materials, you can choose aluminum, titanium, gold, or even diamond bezels! I know that, right? As for color, you can choose black ceramic bezels, titanium body with rainbow aluminum bezels, blue bezels with black bodies, and many more. Surely, each combination will affect on the price tag you got to pay. The lugs are customizable too. For those who are not familiar with what lugs is, it is the part of the watch that connects the body and the strap. 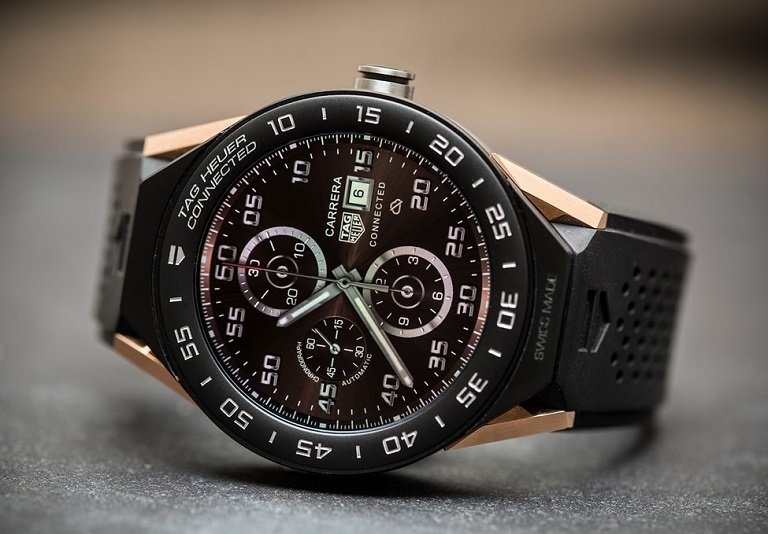 In Tag Heuer Connected Modular 45, the lugs material is vary from diamond crusted, to black ceramic, to gold, to satin titanium. Separating the lugs from the body and strap is pretty easy too. All it takes is a detaching the strap from the buckle. In addition, you can also choose what kind of watch that you want to buy, a smartwatch or analogue modular. So, you can leave the room wearing the traditional classy mechanical chronograph to attend high-club party and leave the smartwatch modular home. Changing smartwatch modular to analogue is pretty simple too. It takes only 30 s to press down a button on each watch side before clicking the main unit in place. Premiumity over features, that’s what Tag Heuer Connected Modular 45 is all about. There’s no heart rate sensor, which is a common sensor found in most of the smartwatch products in the market. There is no rotating bezel, only touchscreen and a single button on side. There is no independent 4G or 3G connectivity just like on the recent models of Samsung, LG, Apple, or even Huawei smartwatches. So, the connectivity depends completely on your smartphone through WiFi or Bluetooth on board. However, this device is completed with GPS, motion sensors, ambient light sensors, microphone and NFC for Android Pay. Under the hood, this watch is powered with Intel Atom Z34XX processor paired with 512MB of RAM and 4GB of internal storage. This is the right media to run Android Wear 2.0 which this watch is empowered. The presence of Android Wear 2.0 bring something new and refreshing to the watch face. At least it’s better than the previous version of this OS. The interface is less confusing, and it allows application to be installed directly from the watch. The power is supplied by 410 mAh battery, which can be charged through magnetic contact plate placed on the rear side of the watch. In normal use, this battery could power your watch for the whole day. First thing, don’t expect the Tag Heuer Connected Modular 45 will be cheap! It’s Tag Heuer, what are you expecting? All premiumity, branding, and class are combined in one product. That’s why every single parts of this masterpiece worth money. In some Tag stores, this smartwatch price starts from 1550 USD, and it goes up to 3100 USD depends on what kind of customization you choose. So, for you who has big profits and think that art is worth money, then you should really think to customize your own the Tag Heuer Connected Modular 45.